This is the Insider's Guide to Being a Wine Critic. And we're sparring no one. Nothing is sacred. We break down the wine critics code - this could get us in a lot of trouble. Over the years, people have asked me what it’s like to be a wine critic. Well, let me tell you. It’s not easy to taste upwards of 100 wines. I spit, but it’s still a bit of a go. Yes. That’s often what I’m up against at a professional tasting. Then there is the steady stream of winemaker dinners, lunches, and samples each week. Frankly, it would be easier if most bottles didn’t disappoint on some level, but they do. I just don’t write about those ones. I’m not blasé about tasting. It’s more than my job; it’s my passion. I still get that great tension in the presence of a flight of wine. The prospect of bringing what may be an exciting sip to my lips always intrigues. But I’ve been doing this long enough to go into each vinous introduction with my eyes wide open. Critics kiss a lot of vinous frogs. And sometimes, no matter how repulsive the wine, we’ve got to fake it. I’m about to let you in on a little secret. A code of sorts among wine critics. At professional tastings, when asked by the bubbly PR/slick marketing guy/zealous winemaker what we think of an unimpressive bottle at professional tastings, we use certain words or phrases to hedge honesty. Call them the double entendres of wine criticism, if you like. (See below). And, when we’re left utterly speechless, we draw on the studious but silent frown, nod, and frantic notebook scribbling to hide the disbelief or, in my case, fit of giggles that might ensue if I looked directly at the person pouring the wine. It actually happened once. I was at the tail end of a long day of winery hopping—known in the trade as a “fam trip”— swirling and sipping samples with a winemaker and fellow critic. One of the wines was vile. Wretched. We were dumbfounded. My colleague dove into his notebook with the telltale frown. And I, having tasted too many wines to hide the hilarity of it, dissolved into fits, wine spraying from my pursed lips. My colleague tried to save me with a limp joke but it was no use. Time to call it a day, bowing out as gracefully as possible. That’s another trick of the trade: knowing your tasting limit. Another question I’m asked a lot is whether wine is just a matter of personal taste. Yes and no. When I taste, professionally, I look for technical correctness more than anything, which is the conduit for pleasure. Balance, fruit purity, appropriate structure, and typicity matter. Without these elements, the wine won’t taste good to me. Or you. And these things are absolutely discernable in a single sip and spit. Complexity, concentration and value for money: two sips maybe. Winemakers critical of critics argue the sip and spit test is a lousy trial. A bottle needs to spend the evening with the taster, the argument goes. Enjoyed in all its phases from first pour to final glass. Ummm no. Although that romantic notion has merit with the pinnacle of the market—think Petrus, vintage Salon, and the like—it is simply not necessary with yet another vintage of Jacob’s Creek Riesling. Or any wine that is under about $25 bucks per bottle, which accounts for the vast majority of the wines produced. Here’s a great wine to try to keep in the fridge: Lustau Solera Reserve Amontillado Los Arcos Sherry. Bone dry with steely-salty, brown sugar, anise, black coffee, Brazil nuts, it will make you swoon. The end. Crowdpleaser: Can mean great value. Or too much residual sugar, obviously there to pump up the mid-palate and hide the absence of character—a.k.a. made to appeal to the soda pop set. Accessible: Can mean balanced and honest wine. Or single note and uninteresting. Usually the latter. Smooth: Can mean finely grained tannins. Or lacks structure. Refreshing: Can mean well-balanced. Or simply searingly high in acidity. Easy drinking: Can mean affable and delicious. Or made in an overtly commercial style. Restrained: Can mean elegant and subtle. Or boring and neutral. Carolyn is the wine columnist for The Toronto Star newspaper and Star Touch. Her work is syndicated through a number of other daily newspapers and she contributes seasonally to Taste Magazine in British Columbia. Carolyn received her formal sommelier qualifications from the Wine and Spirit Trust in London, has written two best-selling wine books, and is a longstanding member of the Circle of Wine Writers. She is a seasoned wine educator, judge, and media personality with 20 years of journalism experience. 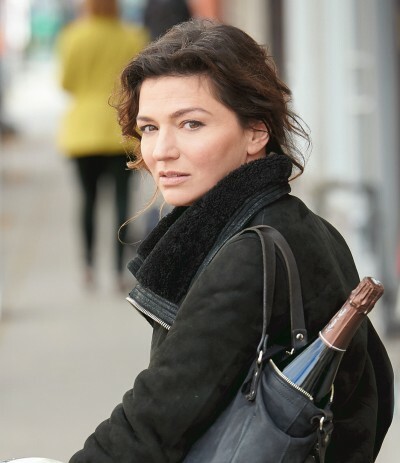 She has appeared on Canada AM, CITY-TV, BON TV and GoingGlobalTV.com, and her reviews and articles have appeared in such eminent publications as Decanter, Wine Spectator, Wine & Spirit International, The Times (London), Maclean’s, Taste magazine and others. In short, she has earned her street cred. Now she spends her time tasting wine (on your behalf, of course) and telling it like it is. Finding you your next great wine is her calling. Along the way, she has shown living well doesn’t have to be pricey or pretentious. Just takes a little know-how, and maybe a corkscrew. A Great Chef + Great Wine = A Great Evening!